Introducing the Ltd. Ed. “Inspired by 1964 Caballero, one of Epiphone’s oldest and most classic designs. Now updated with Shadow™ electronics! The Epiphone Caballero was one of the first new "modern" acoustic guitars designed and built at Epiphone’s new home in Kalamazoo, Michigan in the late 50s when it joined forces with Gibson Brands. The Caballero was a unique design for Epiphone and fit right in with the times as the folk music era was taking off. Though the Caballero stayed in production through the next decade and even longer as the FT-130, the 1964 Caballero in particular has long been a player’s and collector’s favorite. Now, Epiphone celebrates one its most beloved vintage designs with the Ltd. Ed. “Inspired by” 1964 Caballero that brings all of the acoustic guitar’s best features into profile for a stunning reissue of the Epi classic. The Caballero’s small body belies a powerful, full toned “singer’s guitar” that has a punchy midrange that's perfect for both recording and for stage. While dreadnaught style acoustic guitars often steal the spotlight, the Caballero has been a guitar connoisseur’s favorite precisely for its compact size which makes both picked runs and driving rhythms stand out with a sharp, focused tone that’s never boomy. And now the Caballero can plug in anywhere with the Shadow™ ePerformer HD Preamp System and Shadow™ NanoFlex HD low impedance pickup system. 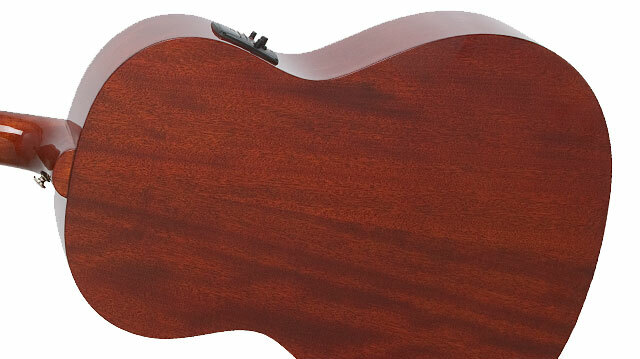 The Caballero’s Select Mahogany top and back have the same profile and materials as hard-to-find (and expensive) original vintage models. The Mahogany neck has a 1960s SlimTaper profile that’s easy for fretting chords or driving rhythm with a 24.75” scale and 20 medium frets. The fretboard has simple “dot” pearloid inlays on the 3rd, 5th, 7th, 9th, and 12th frets with a precisely cut 1.68 nut. The classic shaped Sloped Dovewing headstock has a pearloid script/60s era “Epiphone” logo in gold silkprint. 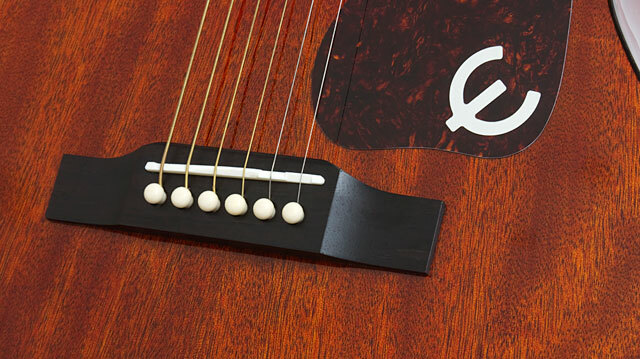 The “bullet” truss rod cover is also period-correct to the Kalamazoo era and has the historic Epiphone “E” in while silk print. The Caballero’s machine heads are 3-in line Wilkinson Deluxe style with a 14:1 ratio with small cream buttons. The Caballero’s controls for the Shado™ ePerformer HD™ Preamp are on the upper bout and include Master Volume, Treble and Bass EQ, Mute, and a Dynamics control that is adjusted via a frequency curve. There is also a low battery indicator and a chromatic tuner. 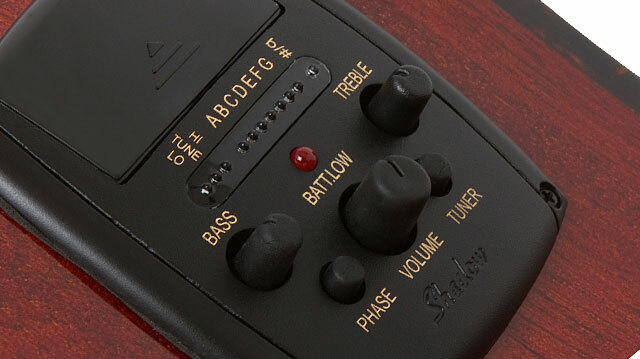 The mute button conveniently silences the pickup during tuning or when plugging in. The preamp is powered by two AAA batteries. The output jack and strap buttons are solid nickel and the Caballero is strung at the Epiphone factory with time-tested D'Addario Phosphor (12-53) strings. Under the Caballero’s saddle is Shadow's proprietary NanoFlex™ low-impedance pickup. Unlike a piezo, the NanoFlex's™ unique and flexible sensing material features integrated active electronics and picks up not only string vibrations but also top and body vibrations as well for a truly acoustic tone without the harshness of piezo pickups. Epiphone and Shadow Germany have worked together for over a decade at perfecting ways to amplify an acoustic guitar on stage without sacrificing tone. And the Ltd. Ed. Caballero is just one of many Epiphone guitars that feature the cutting edge pickup system that can handle any size gig and still produce an "acoustic" sound. On the Mahogany top, the Caballero has a reverse belly bridge with a standard Epiphone compensated saddle that’s set up for perfect intonation. The Caballero has a single band of ivory colored binding around the soundhole and the guitar comes in two finishes—stained Mahogany and Ebony—that both share a tortoise style pickguard for cool classic profile. Both finishes have single layer tortoise style binding on the top and back. Inside the Caballero is a perfect reproduction of Epiphone’s 60s era blue rectangle label with the Epiphone logo and model number.